Very nice - good contact with rental service, full insurance, competetive prices. Car was almost new, 30 000km, A/C working, thank you for good holiday experience!! A nice lady has waited for us at the Airport and took us to the headquarter. There we have got a car. Everything was professional and quick. No problem with giving back a car. No credit card need. I cannot recommend this company highly enough. The pick up process was swift and efficient and the car was new and spotless. I was unfortunate to have an accident during the hire period and the company could not have been more supportive and helpful. It is when things go wrong that you the true quality of a company emerges. As a decades old family-owned business with a local reputation and standing to maintain they were magnificent!!! 25/08/2018 - Zoe Grant - I cannot fault them, they are definitely rècommended!!! We have used Fair Deal for our car hire on both trips to Corfu this year and cannot fault them. Very friendly and courteous, met us at the Airport at unsociable hours after our flight was late. The super collision damage waiver (SCDW INSURANCE) is a great addition at a good price and gives you PIECE IN MIND. 2nd driver FREE, GPS and car chairs offered also. I cannot fault them, they are definitely rècommended!! 24/08/2018 - Nick - Will ensure u have everything u NEED. Highly recommend them. I was at Corfu a month ago, and i was lucky to take Corfucarsrental.com Fair Deal car rentals!! They are very reliable COMPANY, car was in best condition, it took just 5 min to collect a car and the same for giving back. Tassos showed some nice places to check at Corfu. They are really kind and responsive guys. It was my best experience taking a car for hire even in Europe!!! We found them more competitively priced than the big rental names, especially as we had the car dropped off at our accommodation in Kassiopi and returned it ourselves to the airport a few days later. Good car, no hassle drop-off & return, friendly staff. Would definitely use again and would recommend. Compared some prices online and thought they were expensive so decided to throw the net out a bit further and stumbled on Fair Deal - direct hire not an online broker. Best price we had so I just booked it and crossed my fingers. Was due to meet us at hotel at 10.00am but as I walked up I could see a fair deal car in the car park earlier so after the short form filling out process we were on the road. So I would recommend them!!! Fair Deal just the best..
24/07/2018 - Lukasz Sobieranski - We would comfortably use Fair Deal again!! At first I was a bit unsure whether to use less known car hire company but I am glad I did decide to use it as everything was all right, a rep was waiting for us at the airport and took us to the office where I picked up the car. Returning was even simpler as I only handed the keys at the airport and that’s it. It is a good choice for people who doesn’t want to pay silly deposit blocking your holiday money. We would comfortably use it again!! 02/07/2018 - KRIZ - No deposit and No credit card number REQUIRED. Last year we rented a car from Fair Deal Car Hire for 6 days. They had really fair good prices and the car was in excellent condition. They delivered it to the hotel where we could pay by cash. They didn't even need a deposit or a credit card number. Would use them again. 01/07/2018 - Rudi - Fair Deal car rental service..
For one more time.. Simple the best!! 29/06/2018 - Rada S. - Best service. We have travelled a lot to Corfu over the last 20 years and can honestly say this is the BEST car hire service we have experienced. Prompt pick up from Airport only 2 min to the office, car spotless, no credit card nonsence and friendly, helpful staff. We can throughly recommend and gladly use FAIR DEAL next time we visit!! 26/06/2018 - Renate - Fair Deal service!! Have just returned from two weeks in corfu, FAIR DEAL was waiting at the airport, I asked for a car that they thought would be too small so they upgraded to next size at no further cost to me!! Nice car excellent service will use them definitely again!! Thank you FAIR DEAL!!! Tassos and Rena are great, friendly, helpful people, MUCH better than using usual international companies.We had our flight cancelled ( by easyjet, oct 16) and then reinstated without notification and Rena, like xristos at Dimos studios, Kassiopi could not have been more helpful. 26/06/2018 - George A - Fair Deal service. I will add my name to the list of extremely satisfied customers. After researching on here, an getting the advice of other TripAdvisor members, I went with this FAIR DEAL car hire company. I have hired lots of rental cars over the years, all over the world and I have to say, this is about my best experience ever had. They can't do enough for you. Totally helpful, full insurance with NO RISK AT ALL!! 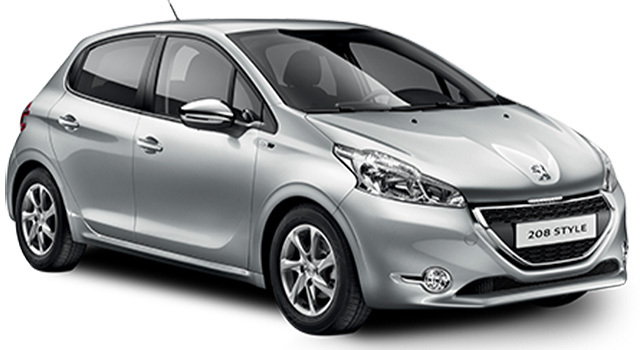 And the little car we hired was Peugeot 108 open top. I'll be using them again next time. I live in Corfu and since a few years, most of my guests use Fair Deal, because they offer a good personalised service at good rates. I would choose them AGAIN. Would definitely use them. Best car hire company I’ve ever used. Picked up at Corfu airport by very polite and helpful rep despite flight being late. Driven to office about 2 mins away. Offered refreshments, clean toilets to change into shorts and t shirt. Form filling took minutes only. Paid on arrival and no deposit needed . Car was perfect and clean . At end of holiday dropped car outside departures and met by the rep as agreed. Would definitely use again!!! After much searching for car rental companies in Corfu who met my requirements of being both competitively priced and with positive (independent) customer reviews/feedback (believe me, you won't find many that fulfil both of these basic criteria!) and having read this thread, I chose to book with 'Fair Deal Car Rentals' online (corfucarsrental.com) following which I received prompt confirmation of my booking from Rena. Our flight (myself, my wife and two young children) was due to arrive in Corfu at 10.40pm (Corfu time) so I had already accepted that I would have to pay the extra charge for 'Out of Normal Office Hours' collection (approx £13) but our flight was actually delayed by almost 5hrs and so we instead arrived in Corfu at 3am (Corfu time) so I was very relieved to find Tassos waiting at the airport for us. The paperwork was dealt with quickly and when asked whether I wished to pay for the extra insurance cover (approx 4 Euro per day) which would then waive the 400 Euro excess that would be applied were we to damage the exterior of the car (ie bodywork, glass, mirrors, undercarriage), given the bad luck we had just experienced with the flight delay and the reasonable additional cost, I decided, for the first time ever, to pay the extra. As it happened, we didn't end up needing it but it did provide some peace of mind not having to worry about potentially being held responsible for scratches/marks on the car upon return. The car itself was a Peugeot 208 and was a fairly new reg, which I wasn't expecting, so was a nice surprise and on return to the airport the following week Tassos, reliable as ever, was there to meet us. Given my experience I am therefore more than happy to recommend 'Fair Deal Car Rentals' to other travellers and will definitely look to use them again should we ever be fortunate enough to visit Corfu again!! 24/06/2018 - Sue S. - Will ensure u have everything u NEED. Highly recommend them. They are BRILLIANT. Do use them. We have used them twice and are VERY happy with their service. They are very good value, very friendly people and provide an excellent service. Tassos, the owner, will ensure you have everything you need and we would highly recommend them!! 24/06/2018 - John - Fair Deal service!! Booked easily and received the confirmation e-mail in a good time. At the airport arrivals (out of hours) the representative was there waiting for us as agreed. He took us to the car and in a few minutes, without bureaucracy and/or extra charges, we were driving a small but good, economic and reliable car with air conditioner, power sterling and cruise control. The car was clean and well maintained. All of that for the best price found by several comparison websites. At the holidays end, the car was returned with out any problem. Many thanks Fair Deal, you made my holidays happier. I stayed In Dassia and pre-hired a car from fair deal. The car was delivered spot on time, there was no fuss. I had payed the excess waiver so there were no worries about damage. The car was far from brand new but was clean, the correct group and in good working order with air con. The car hire people rang me before I travelled to say they only had automatic available in that class and was it ok. I wanted to keep the car an extra day and they were great with that. I would use them again. Thanks a lot for super service! Good price and brand new vehicle fiat 500 cabrio best car for holidays on such beutiful island !!! It has been a pleasure dealing with Fair Deal Car Rental over many years. The representative is there to greet visitors at the airport arrivals. The paperwork takes just a few minutes. No payment is made prior to arrival in Corfu. The terms and conditions are fair. The selection of cars is adequate for all requirements. If there is a problem with a vehicle it is dealt with immediately. Highly recommended. 16/06/2016 - Gina Bishop - We look forward to using your services again next year!! I just wanted to say thank you for making my last holiday so much easier and nicer with a quality car delivered with exceptional service (smiley Tasos). We've been visiting Corfu for many years and have paid at lot of money with other companies for bad cars, long queues and sulky service - never again. We look forward to using your services again next year. 03/06/2016 - Harold Talton & Sally - Thanks again for your help!! Used fairdeal for several years 3-4 times each year, Tass and rene great people friendly and very helpful, you would be hard pushed to find better and no hidden extras, they have certainly got the name right as it a FAIRDEAL. 07/10/2015 - Nikola Zarić - Excellent Service!!! I just want to thank you on excellent service regarding rent a car in Corfu. Everything was as dealed. We hired a car for 7 days in Sept 2015. Car delivered to hotel car-park precisely when arranged and collected a week later with absolutely no hassles. This was all included in a very competitive price. Thank-you very much for your service. 26/09/2015 - Nick Napier-Andrews - Great Service Again!!! 12/09/2015 - Mullard - Great Service!! Thank you very much for the service, we will be returning the car today by 11am on the same conditions we took it. Thank you and see u next year!! Just wanted to say a "thank you" for this thread (and to moonpig for the recommendation). We've returned from a week in Corfu. Our inbound flight was delayed for eight hours, and resulted in our arrival being well after midnight. We phoned fair deal and spoke to Rena (who communicated with us excellently all the way through from booking), and let her know. It was no problem, but did incur an additional 15 euro charge. We thought this was fair enough for a big change in delivery time to the airport at short notice. Car was excellent. Pretty new, clean, with aircon (and, indeed, a higher model than expected). We were met after picking up our luggage and directed to meet Tasos in the carpark around from arrivals. Tasos was friendly, completed the paperwork, and sent us off with verbal directions and a map. Return was equally simple and we met him back in the carpark (had he not been there, we could have left the keys in the car!). For 225 euros for the week, with good insurance coverage, we really cannot fault the service we had, and many thanks to long-standing Ta members for their input. 10/07/2015 - Alessia - Is realy Fair Deal!! Good morning, I am Alessia. the car at the airport around 21:30 as we said on arrival. Everything went fine and we had a marvelous holidays. Next time we come i will rent your car again for sure!!! Thank you for everthing Nikolas, Tassos, Rena !!! 30/06/2015 - Matej Kovic - Great service from Fair Deal!! 30/06/2015 - Francis Templer - Thanks you all for our car!! Thank you all for our car rental in Dacia from 25th / 27th June. Everything went according to plan and we enjoyed the three days exploring your beautiful island. We left the car as agreed in The Corfu Chandris Hotel Car park opposite the hotel with the keys left at the hotel ‘Reception’. We hope all was o.k. when you picked it up? Thank you again. If we return to Corfu, and I hope we will soon, we will certainly use your company again. In the meantime, we hope all goes the way you want it to with your referendum next Sunday and that your country soon returns to normality. We would like to thank you for the car. We enjoyed traveling with such a nice car. I hope we returned car in good condition. See you in September again!!! Just to say thank you for the service provided with the car. I’ll be back in touch soon regarding our next trip in September. 13/06/2015 - FILLA konlm - Great Services Fair Deal. Hello Tassos & Nikolas. I hope that you find out your car on ferry parking. Best feg. And thx for great services. 24/10/2014 - TripAdvisor Forum Review - Many thanks Fair Deal, you made my holidays happier. 11/10/2014 - John Kay - Many thanks Tassos again!!! Hi Tassos. Thanks for a good car yet again for this year, it was great. Could you please book a "panda" for next June 2015- 5th - 12th. We will arrive on usual flights easyjet 8751(5th) and return 8752 (12th). Meny Thanks. John Kay. 08/10/2014 - Alexey Merinov - Fair Deal Corfu car rentals service!! Thank you for the excellent service and great car! I got a lot of fun to travel to Corfu! My advice to my countrymen will not keep waiting. Best of luck! 23/09/2014 - Flavio Martins - It's a really fair deal! Booked easily and received the confirmation e-mail in a good time. At the airport arrivals (out of hours) the representative was there waiting for us as agreed. He took us to the car and in a few minutes, without bureaucracy and/or extra charges, we were driving a small but good, economic and reliable car with air conditioner, power sterling and cruise control. The car was clean and well maintained. All of that for the best price found by several comparison websites. At the holidays end, the car was returned without any problem. Many thanks Fair Deal, you made my holidays happier. Price was very good for me, a bit less than the rest of Corfu rent-a-car companies. Tassos from Fair Deal is a really nice person. He waited for me for a couple of hours, because my flight was delayed. Finally we rented a car from Fair Deal and I would use them again. Our accommodation had been changed a few days before arrival and the car was delivered to the new hotel on time, without any extra charge. The car was in good condition so we were satisfied with them. 01/08/2014 - TripAdvisor Forum Review - See you next Year! We used them last year. Picked up a jeep from the airport. We had a problem with one of the windows. But they changed the car with no hassle. Would use them again. Hello from UK,great service again!! corfucarsrental.com FAIR DEAL car rentals in Corfu dassia. Im really impressed with the fast and friedly service, i will definetly come next year!! !